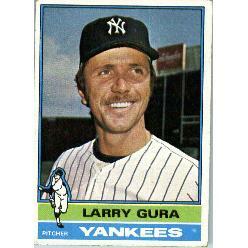 I still remember Larry Gura’s 1974 initial season with the New York Yankees. The young left-hander went 5-1 as a starter on that squad and two of his victories were impressive complete game shutouts. I thought he was destined to become the next great Yankee southpaw but I was sadly mistaken. After Gura posted a 7-8 record in 1975, the Yankees traded the Joliet, IL native to the Royals for catcher Fran Healy. Kansas City brought him along slowly and by 1978, he was ready to become a regular part of the team’s starting rotation. He went 16-4 that year and achieved double digits in victories for the Royals for seven straight seasons. He would have been a great Yankee starter during that time. Like Gura, this Yankee starter was born on November 26th but unlike Larry, he was not traded by New York early in his career and instead went on to become one of the franchise’s all-time great pitchers. This former Yankee reliever and this one-time phee-nom right-hander also share Gura’s birthday.